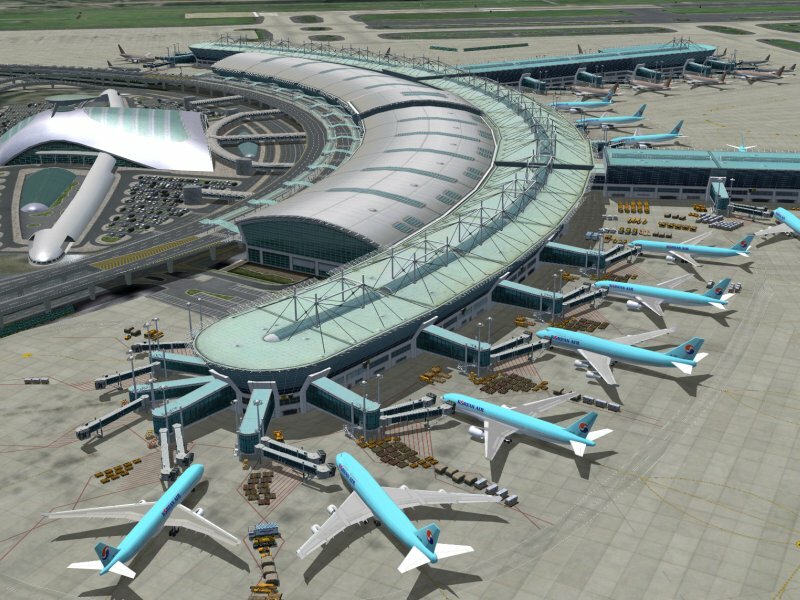 As the main hub for Korean Air and Asiana Airlines, Incheon is one of the busiest airports in East Asia. From Japan, Japan Airlines and All Nippon Airways have service almost all hours everyday. 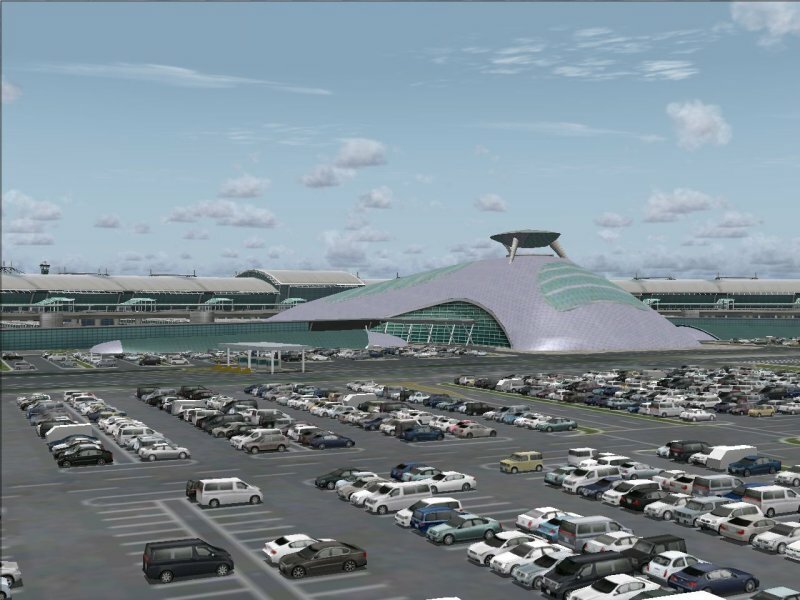 Since its opening in March 29 2001, construction is being continued on several stages, while in 2008, the most expected third parallel 4,000 m runway has been completed. 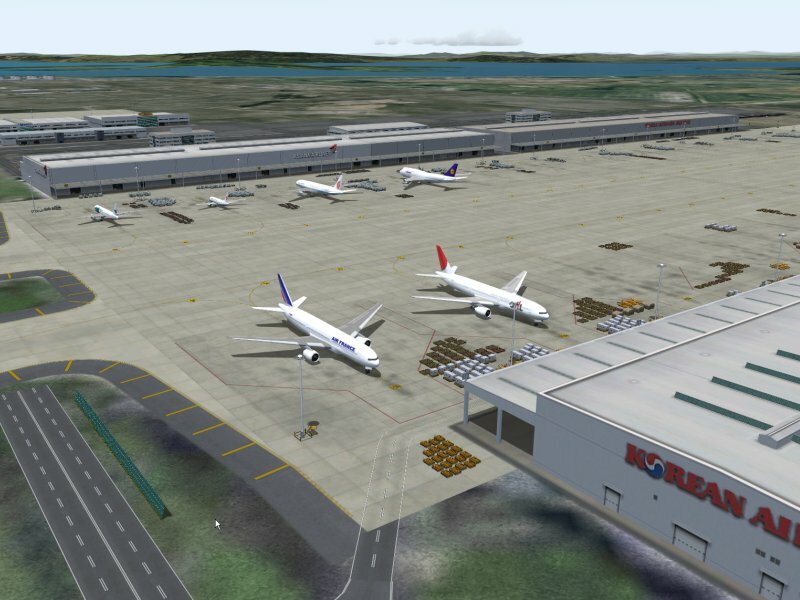 In this package, you will see the third runway which wasn't included in default FS2004 and FSX. 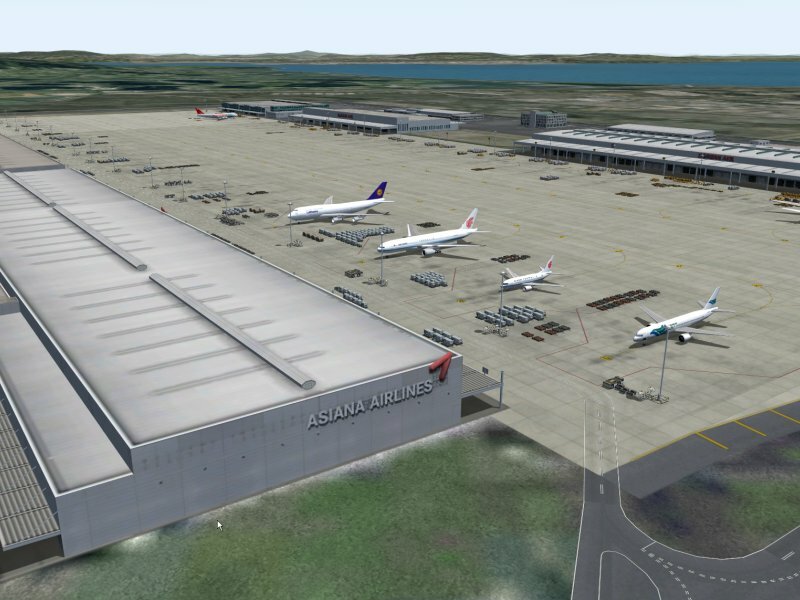 Newly added airport vehicles and general vehicles in full 3D! 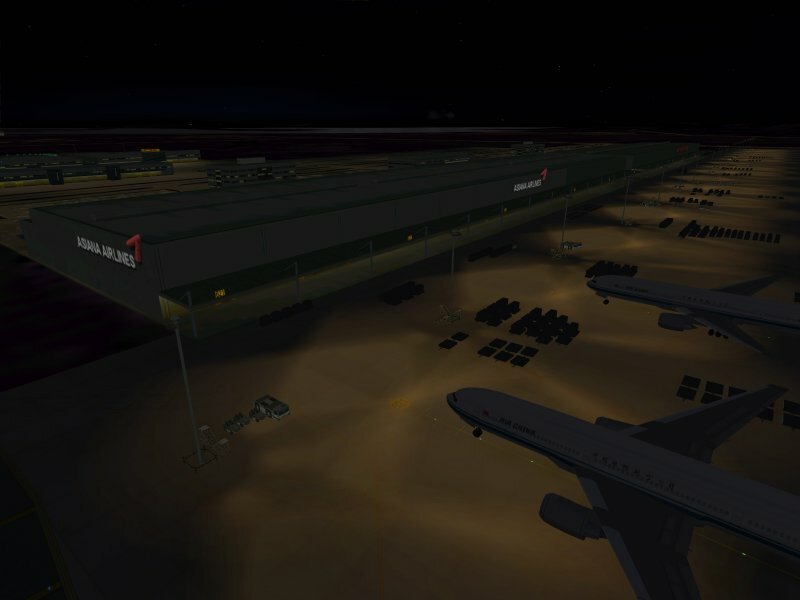 Both airport vehicles and ground vehicles are also in 3D. Parking lots full of cars make your flight superior. 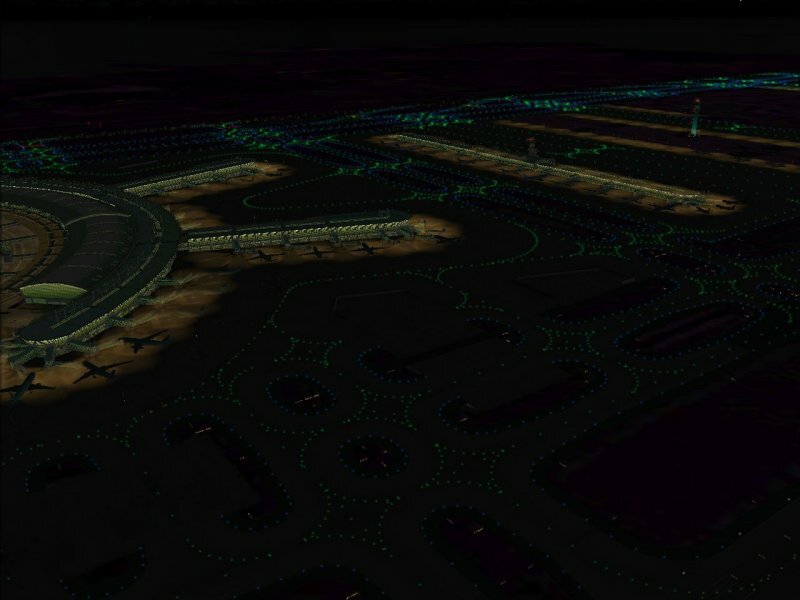 Satellite photograph are used around the airport. 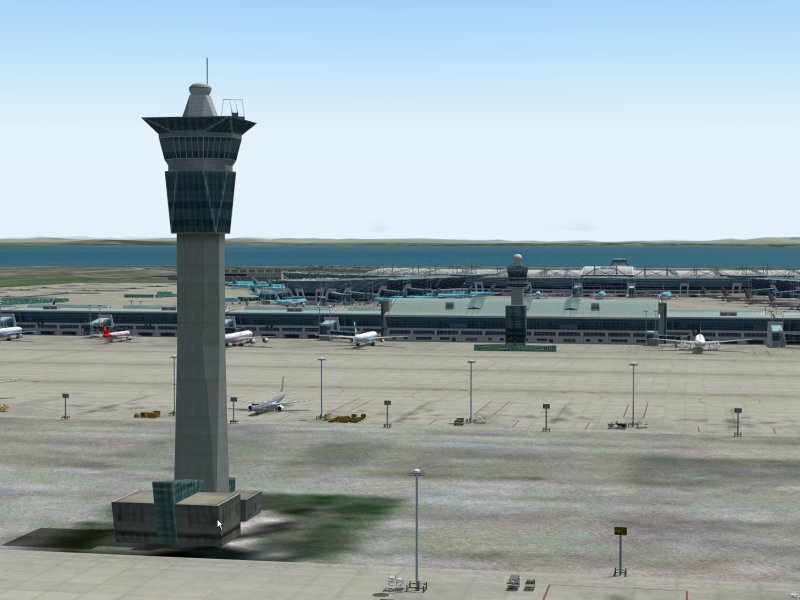 Airport Enhancement Services (AES) is supported in FS2004, FSX will follow with AES2.05! Great scenery and absolutely as real as it get but only several problem. 1. Ground lines has an effect of running across from L to R as well R to L.
2. 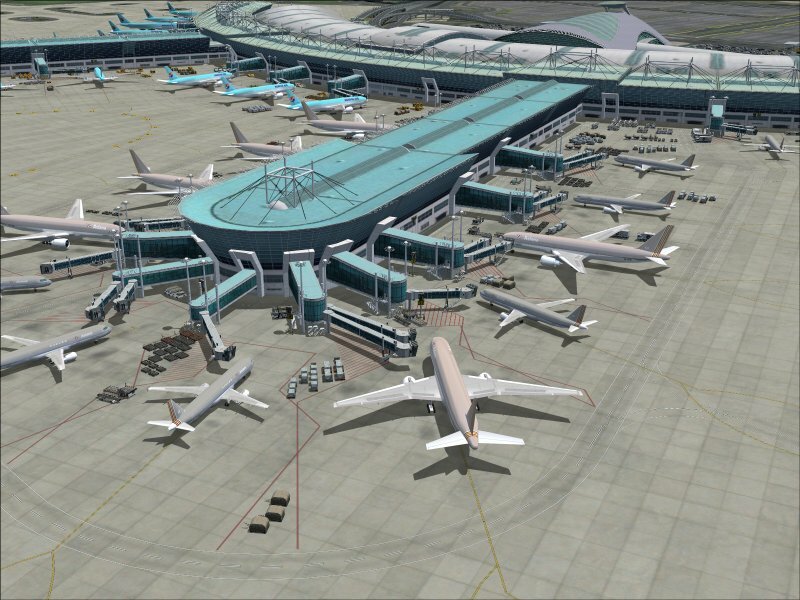 None of the terminal Gates operates nor attaches to the aircraft. 3. 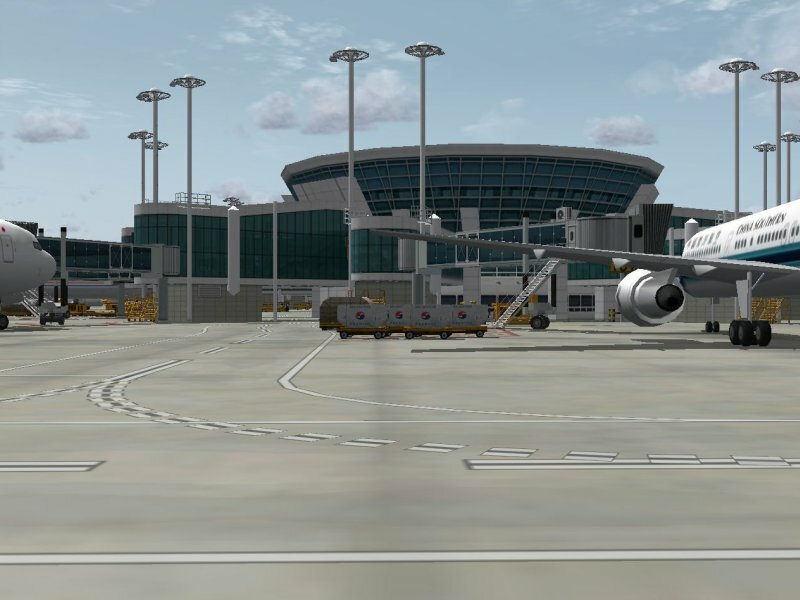 There are several terminal with 2ea Gates none attaches to the aircraft as well. together. A very impressive scenery, I gladly recommend it! The developers over at overland have done it again! 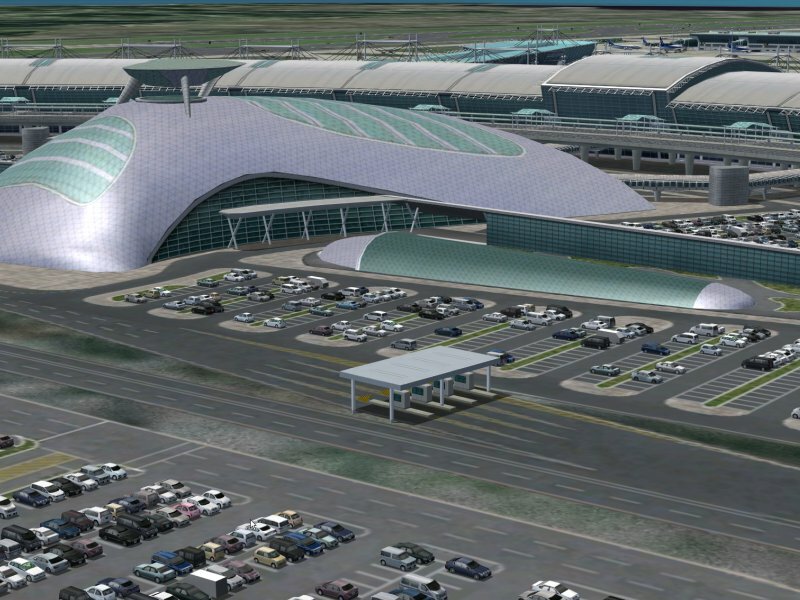 this is such a wonderful airport! and a very important one in Asia. very fun to fly from Incheon to airports in Japan, and also China, Hawaii, etc etc. 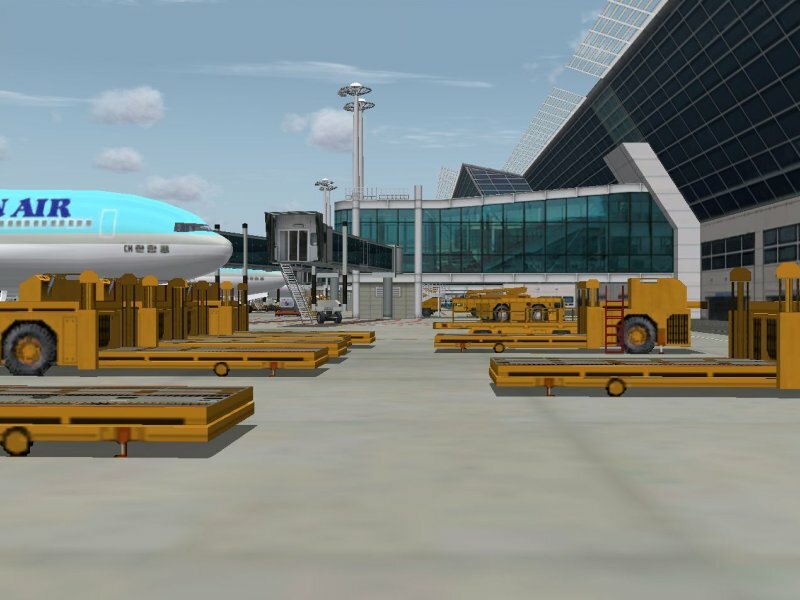 Very nicely detailed terminal and vehicles all over the ramp. 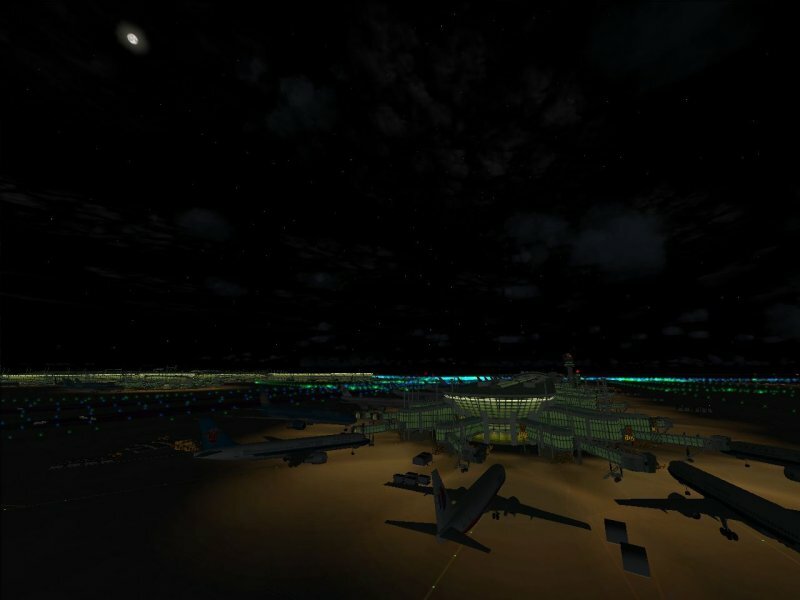 it also has the Hotels, Buildings, Heliport, and Business Center area. 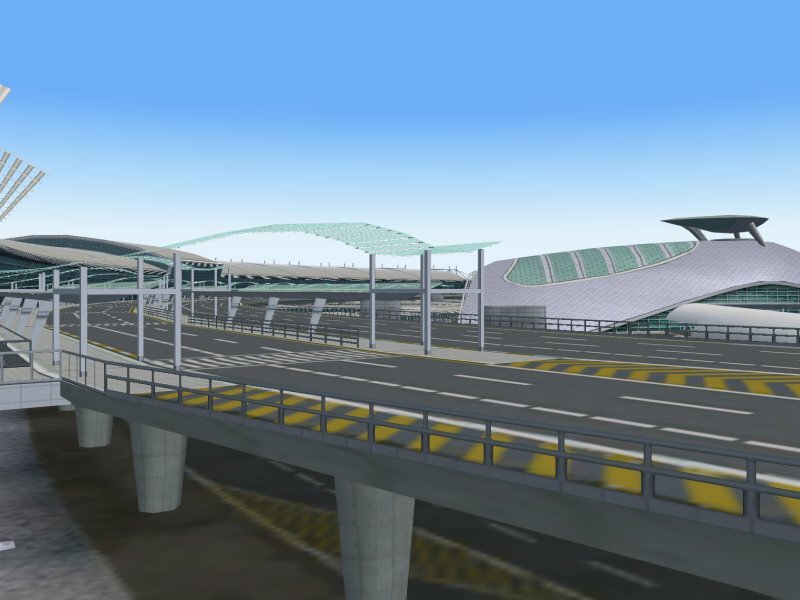 and of course the new Incheon Bridge! and too top it off aes support. 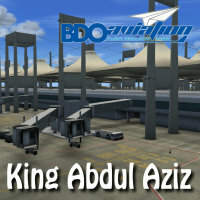 plus a fsx version. definitely look forward towards overlands new projects. 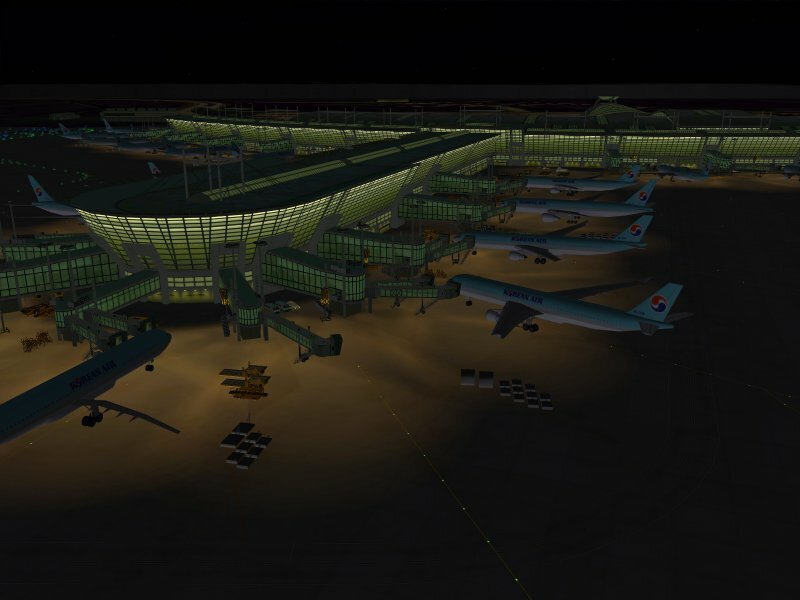 When I bought this fantastic new airport I also had a problem with the ground texture, I also wrote to overland, and next morning they responded to me with an excuses and everything was directly fixed. When I saw this new airport I wanted to have it directly , and I was completed over whelmed with this fantastic new airport which made my Easter weekend a super weekend. I give it a 10 plus. And my compliments to the team of Overland. Many thanks to Overland and Happy Easter to you in Japan. 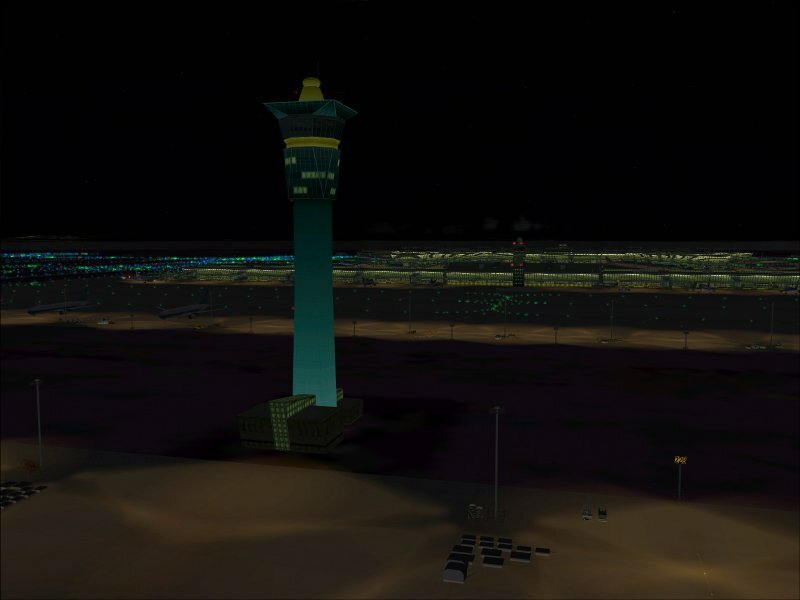 When I bought this airport I had a problem with the groundtexture.  I wrote Overland and they responded very soon and fixed my problem (great service). 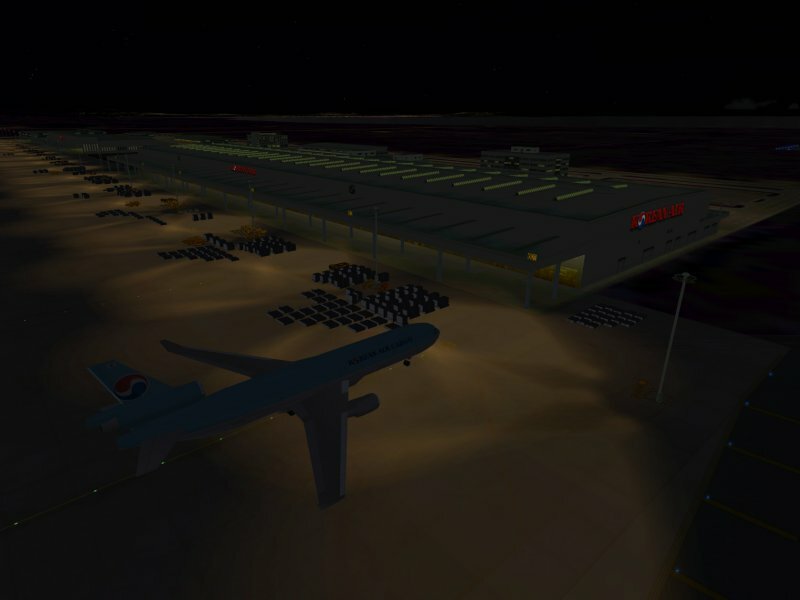 The airport is superb, good framerate, great design and alot of cars, trucks and many other things. Recommend this product highly. I just purchased this product and I must say I was very amazed. 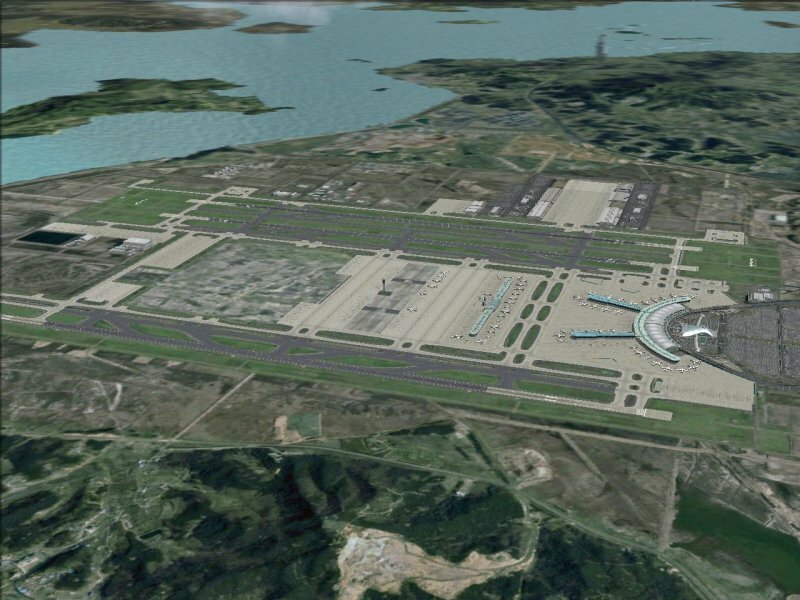 Incheon airport is very beautiful and I have no issues with frame rates it's an amazing airport I highly recommend, you will be pleasantly suprised. 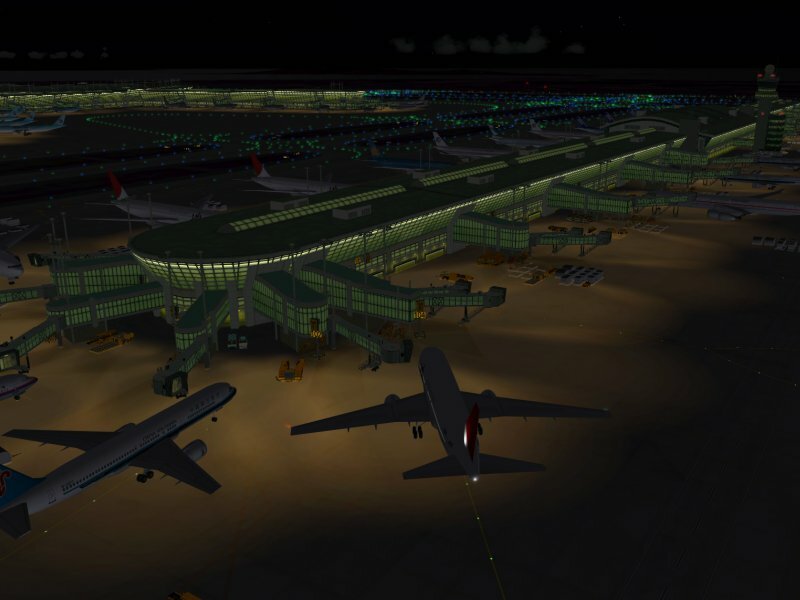 Updates from the previous FS2004 version towards the FSX version are free of charge but Overland requires you visit their 'Free update subscription page' (http://www.overland.co.jp/english/sms/dl_incheonx.html) and follow their instructions. 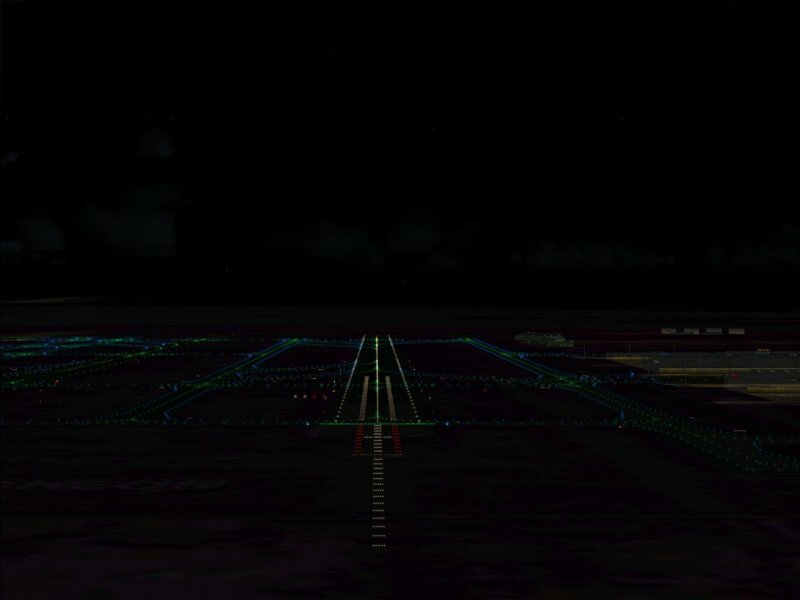 RKSI for FSX uses default texture for the runway due to a weather effect issue. Note: We have tested Windows 7 on our local system, however please refer to Microsoft's official website for compatibility information. [FS2004 version] Very nice ground- and grass-textures with seasonal changes. 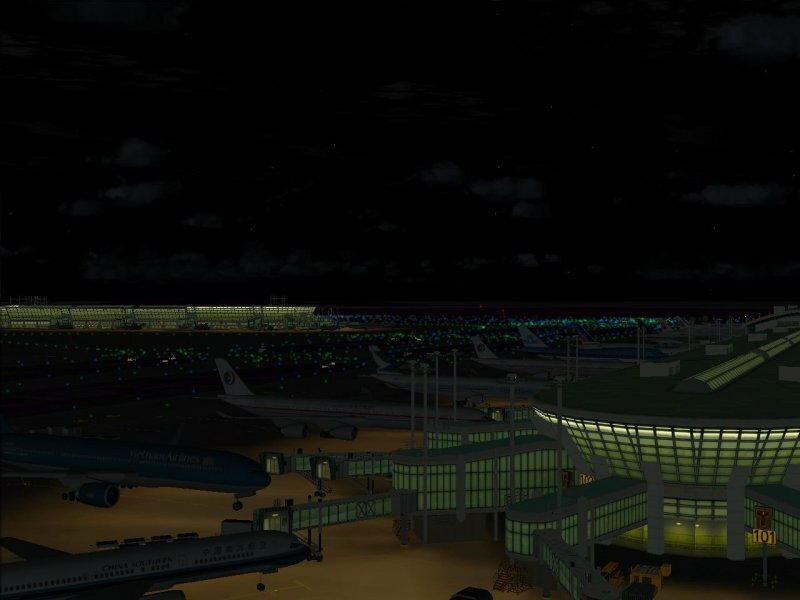 Very detailed and well modelled buildings with nice night textures. 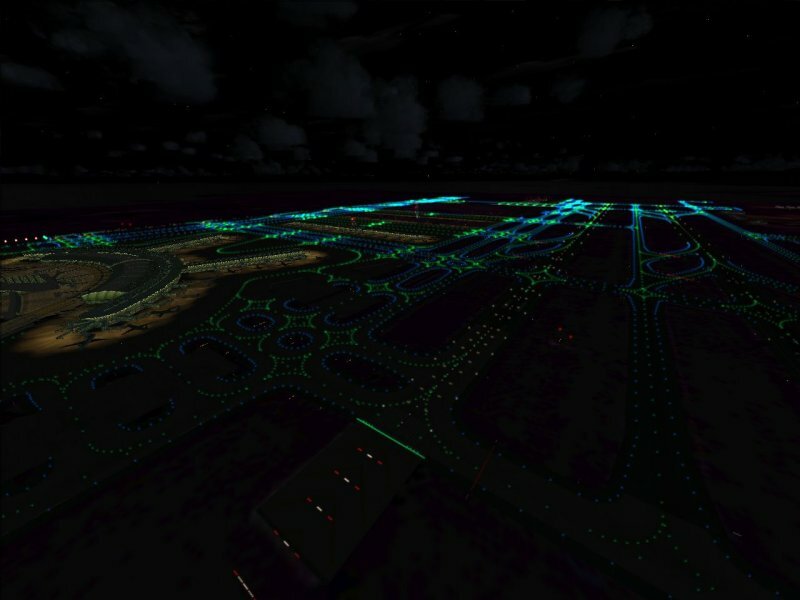 The apron lighting could be a bit better but the lighting of taxiways and runways is breathtaking! 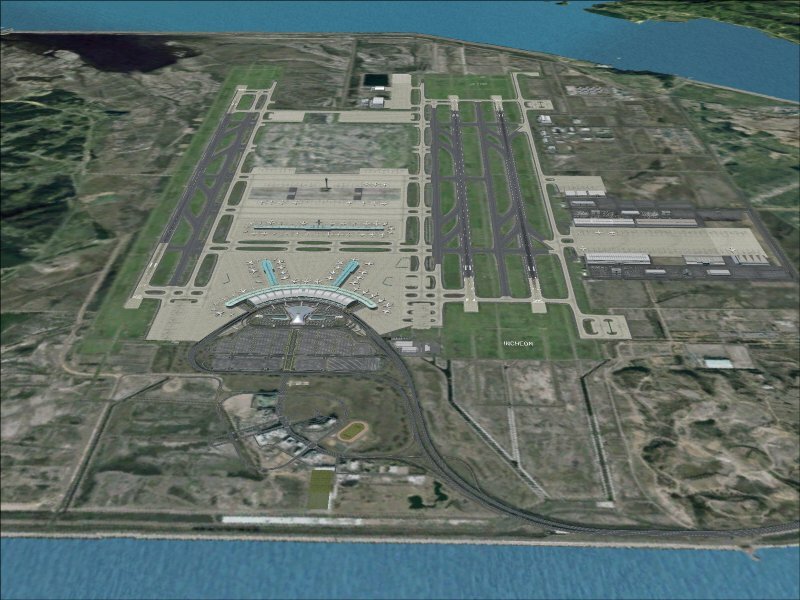 The airport is located on an island which is completely modelled and thus perfectly blends into the surroundings. 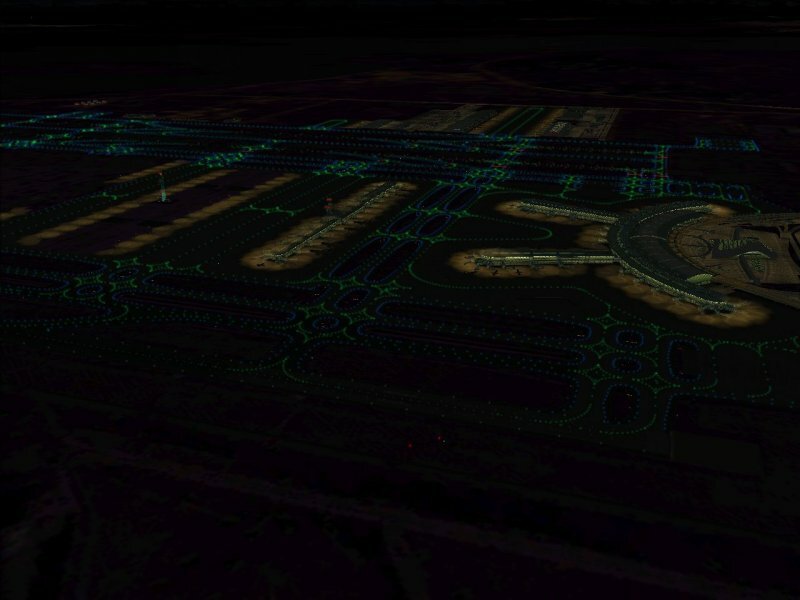 The AFCAD is precise and the airport layout still is up to date 2011. On the whole, the installation is smooth, the manual however (if it deserves the name) is relatively slim. 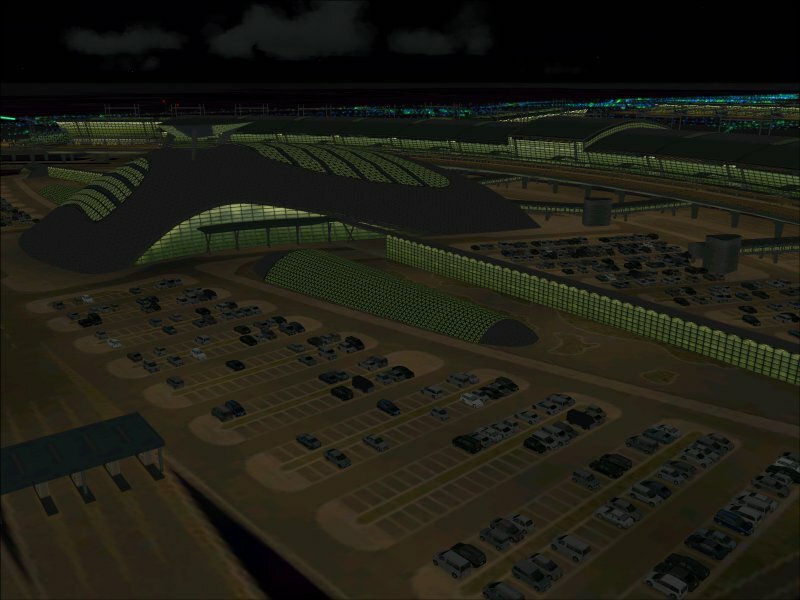 There are several scenery layers which can be activated with the included tool. 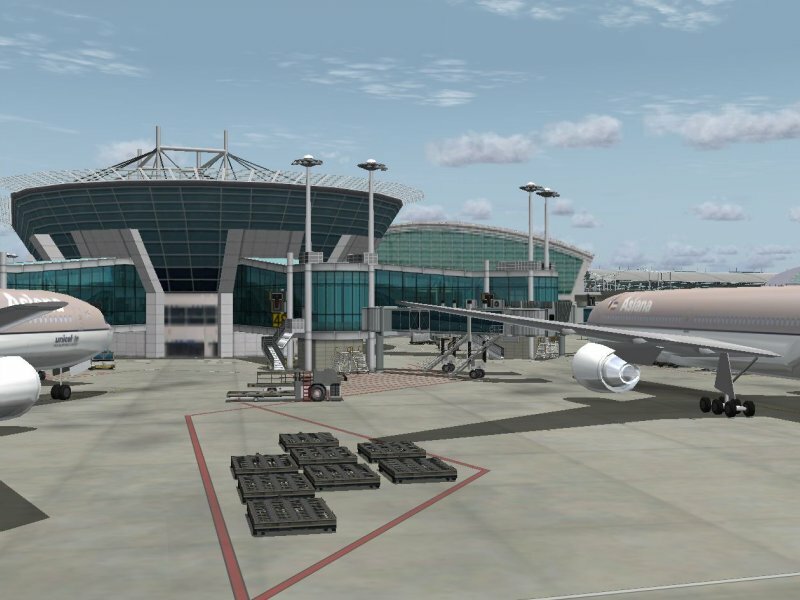 There is no dynamic scenery but very nice ground vehicles so the airport appears lively (ground vehicles only appear when scenery complexity is set to the highest level). 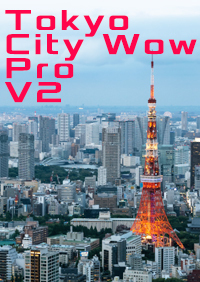 No framerate problems. At least one docking position can handle A380-operations (122). Full AES support available. 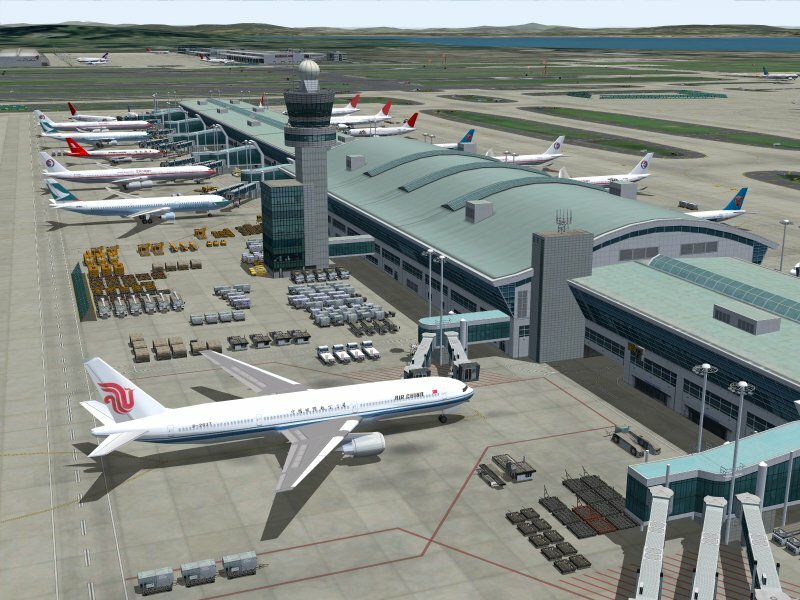 If you compare the price with similar sceneries, it's justified and on top you get the FS2004 and the FSX versions together. A very impressive scenery, I gladly recommend it! The developers over at overland have done it again! this is such a wonderful airport! and a very important one in Asia. very fun to fly from Incheon to airports in Japan, and also China, Hawaii, etc etc. 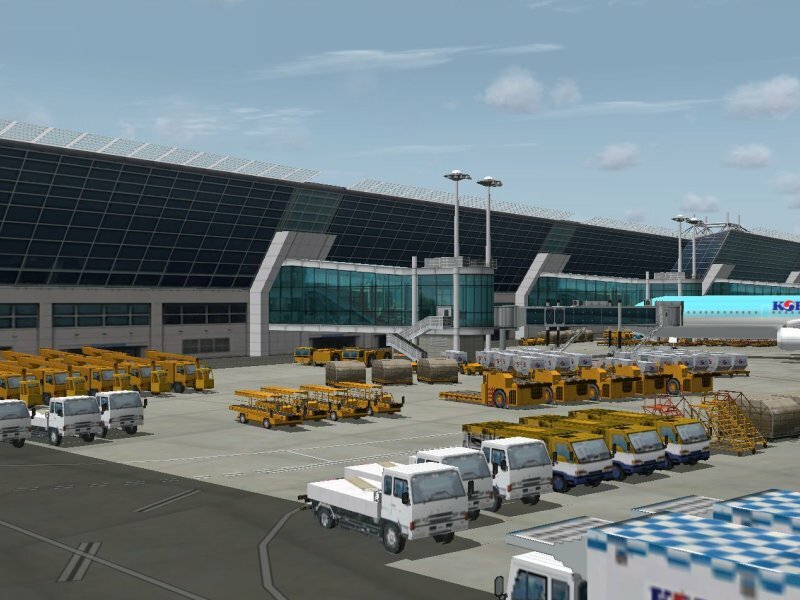 Very nicely detailed terminal and vehicles all over the ramp. 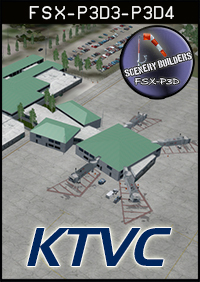 it also has the Hotels, Buildings, Heliport, and Business Center area. and of course the new Incheon Bridge! and too top it off aes support. 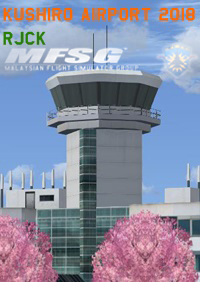 plus a fsx version. definitely look forward towards overlands new projects.